Capt(N) Christopher Robinson, Commander Canadian Submarine Force, presents a NATO Service Medal for Operation Sea Guardian to Lt(N) Eric Isabelle, XO of HMCS Windsor. After returning from a nearly five-month long successful deployment, the crew of HMCS Windsor were recently visited by the Commander of the Canadian Submarine Force (CCSF) to celebrate their achievements at sea. 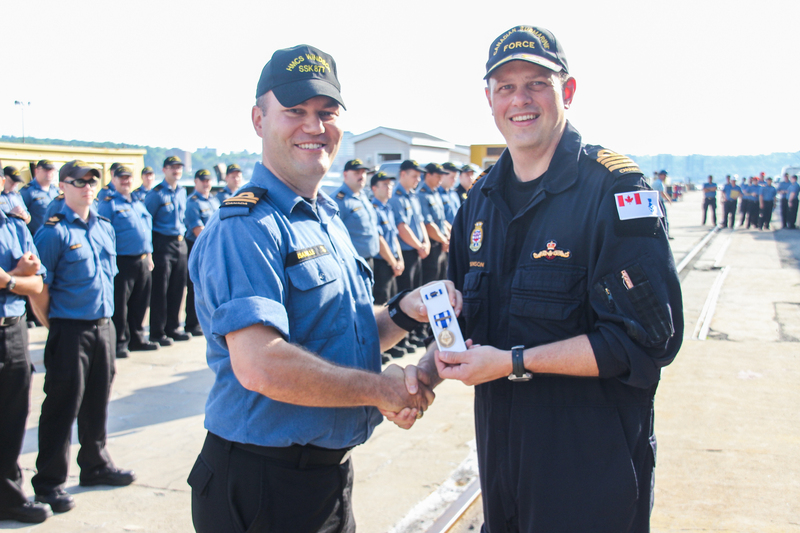 Capt(N) Chris Robinson was in Halifax on July 5 along with Force Chief CPO1 Dave Bryson to congratulate Windsor, as well as to present NATO Service Medals, Dolphin badges and promotions to members of the crew. Windsor returned to Halifax on June 20 after 133 days in the Baltic and Mediterranean seas, where they participated in NATO exercise DYNAMIC MANTA and NATO exercise SEA GUARDIAN. “This team had a very successful deployment, they had some time off with their families, and now they’re ready to go back to sea, so I wanted to be here now to make sure they’re recognized for that hard work,” Capt(N) Robinson said. He presented NATO Service Medals to multiple members of the crew, including XO Lt(N) Eric Isabelle and previous CO Cdr Peter Chu, for their participation in SEA GUARDIAN. The NATO operation took place from April 26 to May 15, and was focused on building a comprehensive picture of daily activities shipping routes in the Mediterranean, contributing to security and safety in that region. The CCSF and Force Chief have also developed a brand new certificate marking qualification in submarines, to be presented to new submariners alongside their submarine badge. “For most of us, qualifying for our dolphins is one of the proudest moments of our military career, and it’s something that should be recognized” Capt(N) Robinson said, explaining the intent behind developing the certificate. The text on the new certificate reads “Having successfully completed the rigorous professional requirements for service in submarines, having gained a thorough knowledge of submarine construction and operation, having demonstrated dedication and reliability, and having my full confidence and trust, I hereby certify that the following member is qualified in submarines”. It was presented, along with the Dolphins, to new submariners LS Brody Gray and AB David Robichaud. Capt(N) Robinson also presided over the promotion of Windsor crew members during his visit. LS Ian Jacobson was promoted to Master Seaman, MS Reeves Matheson was promoted to Petty Officer, 2nd Class, MS Matthew Gray was also promoted to Petty Officer, 2nd Class, PO2 Michael Hamilton was promoted to Petty Officer, 1st Class, and Lt(N) Edward Feltham was promoted to Lieutenant-Commander.